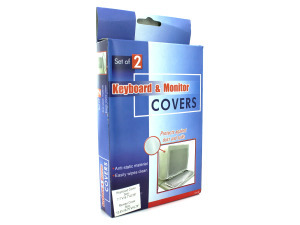 These monitor and keyboard protective covers are great from keeping dust and spills away from your computer. They are made with transparent vinyl and are anti-static. Easily wipe clean. These are packaged in a hanging box. Measurements: Keyboard cover size 7 1/2" x 18 3/4" x 2 1/2". Monitor cover size 13 1/2" x 17" x 17"